12. Unwrap your hood. 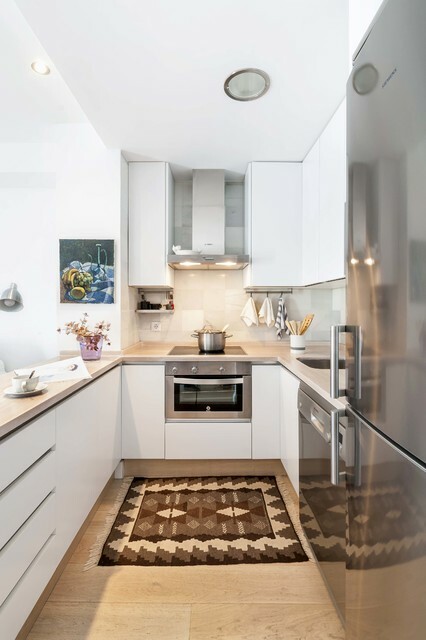 You may not want to eliminate any true upper cabinets, but the partial cabinets that wrap around a hood fan usually have little function other than hiding ductwork. Choose a beautiful range hood that is meant to be seen, and let it create a little visual break from the upper cabinets. Even this small bit of depth can make a kitchen feel less claustrophobic. White cabinets, natural countertops and stainless steel appliances.